Our certified organic infused calendula oil is made on our farm with our vibrant orange calendula flowers in Australian grown olive oil. 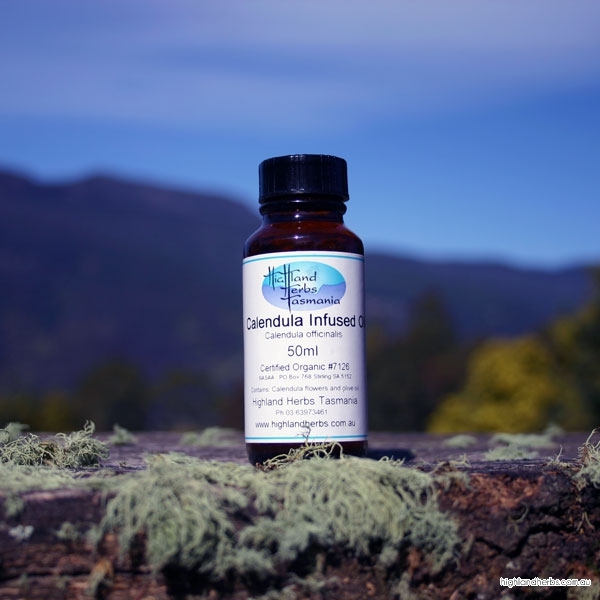 Certified Organic Australian grown, in Tasmania by Highland Herbs Tasmania. Our certified organic infused Calendula Oil is made on our farm with our vibrant orange calendula flowers in Australian grown olive oil. Our Calendula Oil exhibits an unrivalled deep orange colour, reflecting the high concentration of Calendula's healing properties in the oil. Traditionally, infused calendula oil has been used topically for reducing inflammation, healing wounds, rashes, chapped or cracked skin, abrasions, sunburn, eczema and varicose veins.